iPhone 3G Opens Portal to Virtual Worlds; Can Gaming While Driving Crimes Be Far Behind? Denizens of Activision Blizzard’s World of Warcraft (yes…it’s official!) know that the Dark Portal connects Azeroth to the Hellfire Peninsula. Is a new, far more powerful, portal about to open between Azeroth and Cupertino, CA, the heart of Apple headquarters? 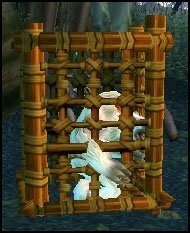 Unless you’re living in a furbolg cage, I doubt it’s news that the new iPhone arrives today, July 11. More importantly, the 3G has been touted as “the most suitable mobile handset yet for virtual worlds and MMOs, given its fast data speeds, slick user interface, and ability to give applications access to its full processing power and other features.” This creates an easy-to-use entry point with wide appeal, giving virtual worlds and mmo games more exposure in the mass marketplace. “Reliable sources” have been chattering about World of Warcraft on the iPhone since the phone’s release, some casting doubt on the iPhone processor’s ability to run the game. But with over five hundred software applications ready for tomorrow’s iPhone 3G launch, optimism abounds that this iPhone can bridge the gap. Keep in mind that WoW’s (or any other virtual world for that matter) first foray into the mobile market doesn’t necessarily have to be the full game experience…how about access to the game mail system or guild chat? Access to the in-game Auction House would satiate a whole legion of WoW fans and probably boost the already thriving game economy. Or port the creation platform for Second Life so people can edit prims on the subway? But could the lack of action by Activision Blizzard allow competition to stealth in and claim the gold? Heavyweights EA and Will Wright (of Sim City and The Sims fame) are keen on Spore Origins, the iPhone’s port of their much-anticipated Spore release. Peak Virtual Entertainment, (“PKVE”), has announced the open beta for its brand new massive multiplayer online web-game: “The Legacy of Holy Castle.” It looks to be leading the race to becoming the first web-browser MMO Strategy Game that is fully playable on both smart phone devices and on PCs. Does a juggernaut like World of Warcraft even worry about these new games or are they just happy to let someone else carry the load of innovation for a change? Social virtual worlds aren’t left out either. In February, Massively covered a sort of proxy Second Life running on the iPhone (YouTube video) and the faster network behind the new 3G iPhone can only enhance the social 3D experience. Third-parties like Boxfab are creating hardware that will turn your iPhone into “a Virtual Reality display device which uses the iPhone as the viewing plate so that it becomes a wearable virtual headset simply by clipping on a special attachment.” Combine this with the new neuroheadset technology and the iPhone becomes an ever more powerful tool. With a potential new market having the size and enthusiasm of the iPhone community, it seems for now that there may be plenty of room for innovation from all sides. How about the real-world impact of increased gaming and virtual world access on the iPhone? Will kids pay attention in school? (Have they ever?) Will automobile accidents skyrocket as drivers play Gran Turismo at stoplights? “Gaming While Driving” laws were proposed starting last summer…they may need to be revisited if these games take off. Paris Hilton single-handedly forced California to take cellphone driving seriously and it was formally prohibited last week. The rest of the country may be following suit under the weight of increased accident statistics and ballooning insurance premiums. Sooooo…who’s getting the iPhone 3G??? About the closest I’ve come to causing a giant accident in the last decade was the one time I was trying to answer an email while driving. It works even worse than you might think. I’ve been going through the same justification process. I even walked down to the Apple store this morning to try and hold one (like that would give me my final answer) but the line was, predictably, around the block. I’m really interested to hear how other attorneys will be using the 3G in their practice and how it might help them. Combine it with the MobileMe service and it seems you’ve got a portable office…or am I being overly optimistic about this thing? I’ve been using one since George Hotz released his unlock. Given my… er… career, doing that hack was impossible to resist, particularly since I was (and still am) a T-Mobile customer. Unfortunately, T-Mobile’s 3G, when out, is running on a different radio frequency than the rest of the known universe, so it will not be possible to make the new iPhone work with it, no matter how elegant the hackery. It’s a simple matter of radio compatibility. Having said that, the iPhone qualifies as a Very Good Phone in my book. It’s not the best device ever made that will single-handedly alter the landscape of communication as we know it. But it is a solid device for my needs, which are a lot of browsing, SMSing, email, and light gaming. If you’re counting on the Exchange integration or MobileMe, I’d recommend waiting a few weeks – initial reviews of the device are not going to really express what it’s like to live with something. That takes some time, but it’s worth the wait. i’m not getting one… nor will iEver purchase iAnything, because iThink Steve jobs is a tool, and his marketing is more effective than his technology. Plenty of phones, palm computers, and things that do all that the iPhone does, however, no one knows about it, cause people just notice the iPhone. Same with the iPod…. I can’t believe people are still that stupid, buying an iPod instead of buying a 2gb flashdrive that plays MP3s for $10. iHate that iCompany.